The most visited attractions in Bangkok expose visitors to Thailand's fascinating history, despite Bangkok's relatively recent construction as a city. The most impressive of these is the enormous and extremely ornate Grand Palace, and the adjacent Temple of the Reclining Buddha. Numerous temples spread over older districts near Chao Phraya River, making up an inexhaustible number of interesting visits, each one with a unique religious significance. 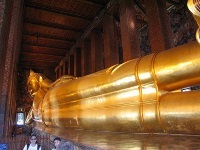 Attractions in Bangkok aren't all serene sights as the city also holds a vibrant and flashy appeal. Among the most fun of attractions is watching a Muay Thai boxing fight; put some money down to increase the thrills. Bustling markets, which sell literally almost everything, can be wandered for a full day, especially the giant Chatuchak weekend market. 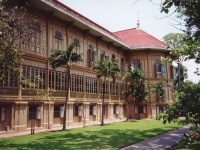 The unique character of Bangkok neighbourhoods encompass many small treasures. Both Khao San road in Banglamphu district and alleys off of Sukhumvit are attractions in themselves. The first is a backpacker's Disneyland, and the second an expat playground famous for its debauchery. Little Arabia, a middle-eastern district, is also a unique and fun place to explore. Hiring a river cruise is the only real tour of the city, although only a few attractions are visited.